Written by Jeff Epstein, Editor of Citizens’ Media TV. Free tuition is only for those that work hard and earn their way into college. Students must have satisfactory grades and test scores, and they must apply and be accepted by the university (or college). It is a myth that “anyone” can just walk into a university and take classes because they happen to be free. Free tuition is also a great equalizer among classes, races, and cultures. As long as you do indeed earn your way in, you no longer have to worry about economic discrimination or the circumstances of your birth as being a barrier to upward economic mobility. Conversely, not providing free tuition is a tool used to further disadvantage the poor and minorities, and unfairly advantage the wealthy and powerful. In Finland, Denmark, Ireland, Iceland, Norway, Sweden and Mexico, public colleges and universities remain tuition-free. They’re free throughout Germany, too, and not just for Germans or Europeans but for international citizens as well. That’s why every year, more than 4,600 students leave the United States and enroll in German universities. For a token fee of about $200 per year, an American can earn a degree in math or engineering from one of the premier universities in Europe. “About seven in 10 (69%) college seniors who graduated from public and private nonprofit colleges in 2014 had student loan debt,” according to a report by the Project on Student Debt at The Institute for College Access & Success (TICAS). “These borrowers owed an average of $28,950.” From 2004 to 2014, average student debt rose by 56% from $18,550 to $28,950. There is more student debt in the United States than either auto loans or credit card debt. His easy-to-read and concise summary on the subject, on his presidential campaign website. Bernie Sanders’ 2017 College for All bill does not assist those who make more than $125,000 a year. His original 2015 version, as trumpeted during his campaign, has no limit on income. Sanders’ less restrictive 2015 bill has a cost of approximately $75 billion per year. It is paid for by a tax on Wall Street speculation, which, conservatively, raises about $150 billion a year. 69% of those making less than $36,000 want it. 70% of those 18 to 34 years want it. 61% of those making less than $36,000 want it. 63% of those 18 to 34 years want it. 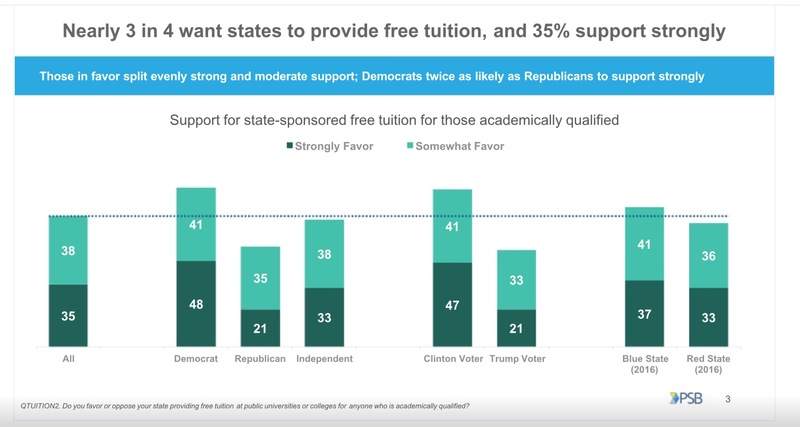 In a 2017 poll (conducted after November’s election, by Penn Schoen Berland (PSB) on behalf of the Campaign for Free College Tuition (CFCT)), this increased again to 73% of Americans overall, 89% of democrats, and even 56% of Republicans. (Aside from New York, other tuition-free state programs are described in the MCTF book). The just passed New York “free tuition” program is called the Excelsior Scholarship. It saves a family whose income is $100,000 or less (increasing to $125,000 by 2019) about 30% on tuition costs. Even ideally, a student must be prepared to pay up to seventy percent. But there are so many restrictions on the program, it will only result in benefits to a small slice of middle-income students, and an even smaller amount of low-income students. [L]ow-income students often must interrupt their studies to work. At the state’s community colleges, more than 90 percent of students would not qualify for free tuition based on those requirements. Even at its four-year colleges, 60 percent would be ineligible. After graduation, scholarship recipients must live and work in New York for as many years as they received a tuition award. If they break that commitment, the tuition grant becomes a loan that must be repaid. [I]f they continue to live in New York but work in one of its 5 border states, they will suddenly be saddled with debt…. [I]f they go off and serve, they must repay debt…. People who need to leave New York to care for a family member will also be smacked with debt.